Why Can Not We Be friends? ‘Gentlemania’ has treaded lightly into Vermin’s path – Will anyone help Jervis Cottonbelly? Jervis Cottonbelly has been treading lightly (and accidentally) into Vermin’s unholy path since joining the roster of Championship Wrestling from Hollywood. Jervis debuted on what, arguably, was the biggest day in Vermin’s history – the day they captured all of the gold in CWFH. It was a day when all eyes should have been on Vermin, yet a fair amount of that attention was stolen away by the debut of one of the more unique wrestlers in the history of the industry…and you don’t steal from Vermin. Soon after his debut, Jervis was taken under the collective wings of both “Pretty” Peter Avalon (PPA) and Hobo. The two trained him to be more ‘fierce’ in his in-ring battles. Problem was both PPA and the Boxcar Superstar were sworn and bitter enemies of Vermin…and you don’t become friends with Vermin’s enemies. It wasn’t long before Mr. Cottonbelly found himself scheduled for a pair of singles matches with members of Vermin. Though Cottonbelly came up just short in both contests, he very nearly won both. Lapses-in-judgment by Jervis allowed victory to slip away on both occasions. The victories would be described as ‘embarrassing wins’ for the members of Vermin…and you don’t embarrass Vermin. In a show of friendship, Jervis agreed to tag team with his friend PPA in a battle against Vermin. After the match concluded, Vermin attempted to exact revenge on PPA for knocking out their leader Yuma, but Jervis stayed to protect his friend. This backed Vermin even further into a corner…and you don’t corner Vermin. Watch Hollywood Heritage Champion "Pretty" Peter Avalon team up with Jervis Cottonbelly to take on Joey Ryan & Kevin Martenson of Vermin from last week's episode of Championship Wrestling from Hollywood at http://smarturl.it/CWFHTune-in to an all new episode this Saturday at 4PM on KDOCTV Los Angeles and 9PM on Youtoo America! Jervis’ accidental feud with Vermin caught the attention of Vermin’s most-hated rivals of all – the owners of CWFH, the Marquez family. Nikko Marquez designated Cottonbelly as the leader of the anti-Vermin offensive and Cottonbelly set out to find compatriots in his struggles. Cottonbelly started with a strong team – pairing with Los Primos Rivera and JR Kratos against the full ranks of Vermin (Joey Ryan, Ryan Taylor, Kevin Martenson and Bad Dude Tito). But, things quickly fell apart. Kratos’ and Tito’s hatred for one another caused them to brawl into the locker room before the match could conclude. Vermin then isolated and decimated Danny Rivera. Rivera and his cousin quickly realized they had little to gain by feuding with Vermin, so they abandoned Cottonbelly. Ever the competitor, Jervis stayed to fight with Vermin and lost badly…because you don’t fight Vermin alone. Undaunted, Cottonbelly again scoured the locker room for assistance. Yet again, it seemed like he had found it. He and his new partner, Douglas James appeared to be firing on all cylinders as their new team faced the same Los Primos Rivera that had abandoned Jervis a week prior. In the closing seconds of that match, with victory seemingly in-hand, a cell phone call drew James away from ring and Jervis was left alone again. And Jervis lost. Again. The battles, the disappointments, the abandonment…the Vermin…it all has to be taking a toll on Jervis Cottonbelly. He must know that Gentlemania alone will not be enough to exterminate Vermin. 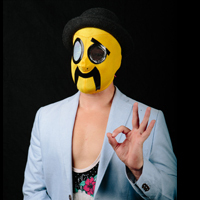 As such, Jervis has promised to journey beyond the locker room walls, to scour the seas, to search the air, to ride the rails and to walk the highways until he can find a partner in his most-good of fights. Will Jervis Cottonbelly ever find a partner he can count on? Or will this be the end of ‘Gentlemania’ as we know it? Tune into Championship Wrestling from Hollywood to find out!